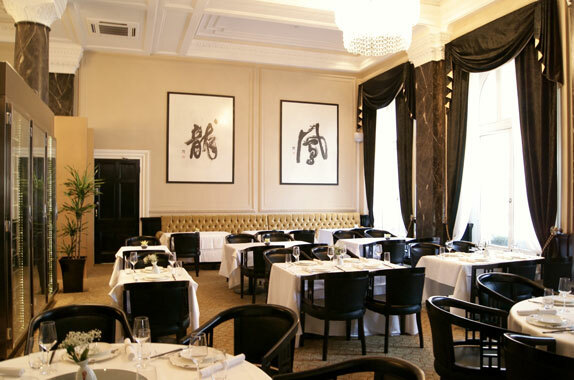 This recently-opened Chinese restaurant, Grand Imperial, occupies part of a striking building and has undergone a £2m refurbishment. It’s part of the Grosvenor Hotel right next to Victoria Station. The Grosvenor is one of London’s great Victorian railway hotels, which still retains many period features reflecting its heritage. 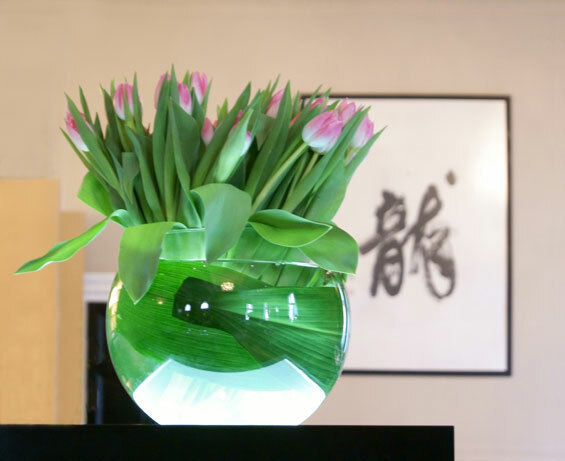 The hotel, formerly known as Thistle Victoria, is within walking distance of many of London’s famous tourist sites including Buckingham Palace and the Houses of Parliament. Entrepreneur Rand Cheung has created a stunning restaurant with a design guided by the principles of feng shui. The opening night had a lion dance for luck, but this isn’t an over-themed restaurant although there are plenty of tasteful hints at Oriental opulence and style. Grand Imperial is part of a Malaysian restaurant group which opened their first restaurant in Kuala Lumpur in December 2008. This London restaurant is their fifth project, but the first outside Malaysia. The Head Chef at the restaurant is Leung Chi Keung, who has over 20 years of experience in high-end restaurants in China. This is one of the most impressive restaurants of any ethnic persuasion. The high windows are draped in stark black curtains which offer a stylish contrast against white linen and gold-leafed screens. 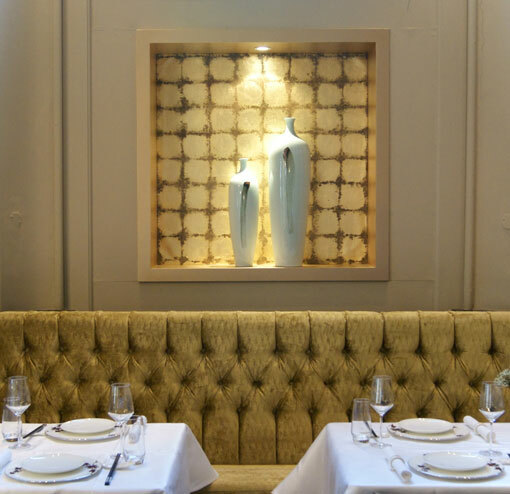 There is a VIP suite hidden behind those screens and that offers private dining in the most sumptuous style. The menu is varied and enticing. Yes, it’s true that one eats with one’s eyes, and the chef here displays outstanding presentation skills as well as a sense of adventure. He uses Foie Gras to great advantage in several dishes. Something here for every taste with a great selection of fish and shellfish in all its guises. My starter platter of dim sum included Jellyfish with Chilli Sauce. This was vibrant with flavour and heat with an agreeable texture. Nothing slimy or sinister here. Served chilled it was refreshing and light. Jellyfish is said to be good for sore throats. The seafood shreds were joined by a grilled Goose Foie Gras Dumpling which was piping hot, rich and flavourful, but the star of the plate was the succulent Roasted Duck with its lacquered skin. Sautéed cubes of Beef with Black Pepper Sauce served on a bed of onions was an absolute triumph. The meat was as tender as I have ever had, but the sauce was the memorable element. Black pepper is a much-underrated spice. It has graced even the most humble of dinner tables for centuries and we take it for granted. The Grand Imperial has a recipe that shows the qualities of those peppercorns with a dish that has unadulterated flavour and aromatic warmth. Don’t miss this one. Pan-fried Stuffed Scallop with Minced Shrimp and Foie Gras sounded a strange combination. Yes, it’s easy to envisage all types of seafood combining harmoniously together but I wasn’t sure how the second appearance of foie gras would work. The scallop was tender and the foie gras was served as a fine sauce, which was mild and savoury and a much more subtle accompaniment than the usual bacon or chorizo. Wok-fried rice “Hokkien” style with Duck and Prawns in a rich gravy is a dish that is similar to those found in Fujian province in south-eastern China. This was probably the most recognisably traditional course from the menu. The rice filled any little empty corners we might have had, and had the appeal of home cooking – nothing spicy and with no particular ingredient taking centre stage. This was Chinese comfort food. Chilled Cream of Sago with Mango and Pomelo was a cool and soothing dessert. Saffron-yellow with evidence of real fruit. No need for fear: the sago is nothing like the wallpaper paste effort of school days. The dessert was sophisticated and refreshing. The food at the Grand Imperial is excellent and the décor is well considered, taking advantage of its imposing Victorian architecture as well as paying homage to China. Its location will assure its success, but it deserves to have its food taken seriously as well.